J.R.R. Tolkien's The Lord of the Rings took first place in a recent nationwide British poll to find the greatest book of the century. He may be the most popular writer of our age, but Tolkien is often misunderstood. This major new study of his life, his character and his work reveals the facts and confronts the myths. It explores the background to the man and the culture in which he wrote. Tolkien: Man and Myth observes the relationships that the master writer had with his closest literary colleagues. It reveals his unique relationship with C.S. Lewis, the writer of the Narnia books, and the roots of their estrangement. In this original book about a leading literary life, Joseph Pearce enters the world created by Tolkien in the seven books published during his lifetime. He explores the significance of Middle Earth and what it represented in Tolkien's thinking. Myth, to him, was not a leap from reality but a leap into reality. 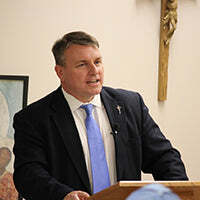 Joseph Pearce is an English-born writer, and as of 2014 Director of the Center for Faith and Culture at Aquinas College in Nashville, Tennessee. He is known for a number of literary biographies, many of Catholic figures. Formerly aligned with the National Front, a white nationalist political party, he converted to Roman Catholicism in 1989, repudiated his earlier views, and now writes from a Catholic perspective. He is a co-editor of the St. Austin Review and editor-in-chief of Sapientia Press. He also teaches Shakespearian literature for Homeschool Connections, an online Catholic curriculum provider.